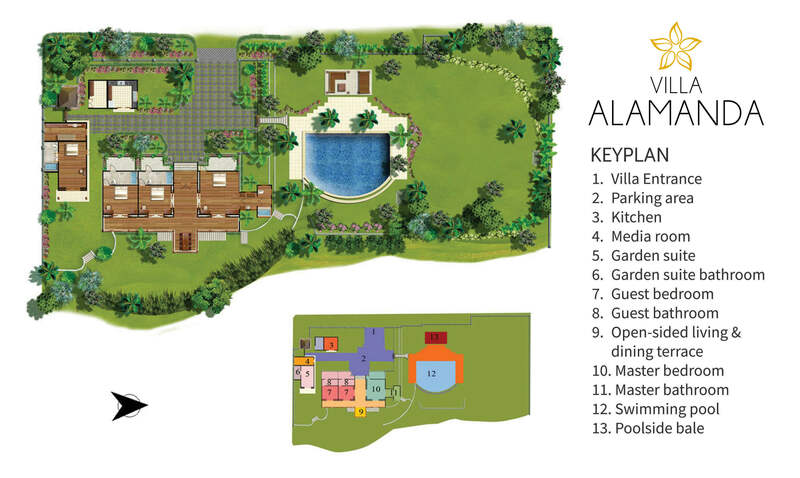 Villa Alamanda is characterised by a delightful T-shaped terrace that stretches the length of the main house. This beautiful open-sided living space features polished wooden floors, high ceilings hung with overhead fans, and wooden balustrading that makes the most of the villa’s picturesque natural environment. Two daybeds adorned with silk cushions provide the perfect places to meditate and enjoy soothing sounds on the Bluetooth or USB speaker. A curved 11 x 8-metre blue-tiled infinity swimming pool gives the illusion of disappearing into the ravine as water cascades over its edge. Sun loungers and umbrellas rest on the Palimanan stone pool terrace strategically placed to capture the sun. A round outdoor dining table is ideal for casual poolside dining while the thatched balé, equipped with bright coloured cushions and a Bluetooth or USB speaker, is perfect for sunset cocktails.